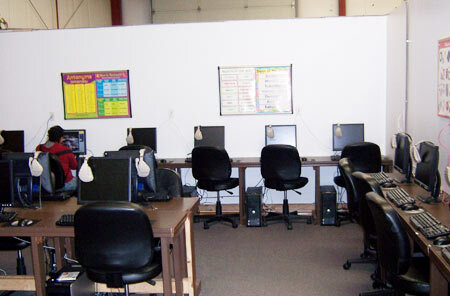 The CSIRP English Language Training Program has evolved over the years to include classroom instruction and a sophisticated computer learning lab featuring use of the Rosetta Stone Learning Program. In use since 2001, and updated in 2008, the Rosetta Stone Program features two way interactive, student progress tracking, and in-depth exposure to grammar and sentence practice in a gradually difficult series of lessons. While all progress in absorbing the English language is of value, the primary focus of the program is to prepare a student for employment. Classes have a heavy focus on issues surrounding the workplace and it’s environment. Issues such as workplace safety, group dynamics and interaction, and terminology commonly found in work settings is mixed into the evolving language lessons. Emphasis is placed on getting the new language learner to venture out and use the English they are learning, both in class and at home. Home work assignments are common as are essays or letters addressing issues discussed in the classroom. Our ELT teachers combine the student progress information captured in the student performance database, with interactive feedback they receive from students in the classroom, to evaluate each student’s progress. As a result, teachers know when a student leaves the program for employment, how much progress has been made. Students are evaluated on a monthly basis with advancement noted in their permanent record. That record is printed out and becomes a part of their case file. Records include attendance, evaluations and advancement information. 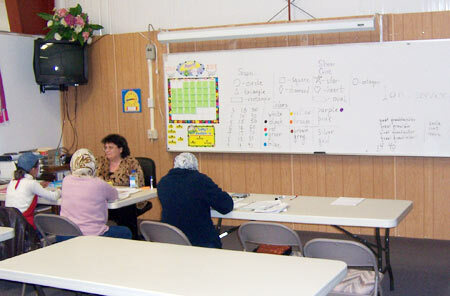 Under the CSIRP ELT program, the student is picked up four days a week and brought to the on-sight facility to participate in two hours of English language training. In cases where family members cannot rotate attending ELT classes, child care off-site is provided. Attendance is mandatory for all those required to search for a job or receive cash assistance. Those taking jobs are also encouraged to continue coming to class where possible considering their work schedules. Information is also posted and discussed in class about the evening opportunities at the CSI Adult Basic Education English language classes on campus.